Diwali is around the corner and there is much to love about this festival. New clothes, fun with friends and family, the feasting, and of course the fireworks. This season is a big celebration for more than a billion people around the world, and though there are many stories connected around this festival the main theme is always the victory of good over evil, and light over darkness. It is also considered a great time for new beginnings and many communities in India celebrate the Hindu New Year. My hubby and I have lived away from India for many years now and I find festival time is a perfect opportunity for us to reconnect with our Indian heritage. To be honest I didn’t always do a very good job of this but since the kids came on the scene I am more conscious of the distance between India and Canada. As a result I make more of an effort to celebrate and share in festivities. One of my favourite parts of Diwali has always been the food. 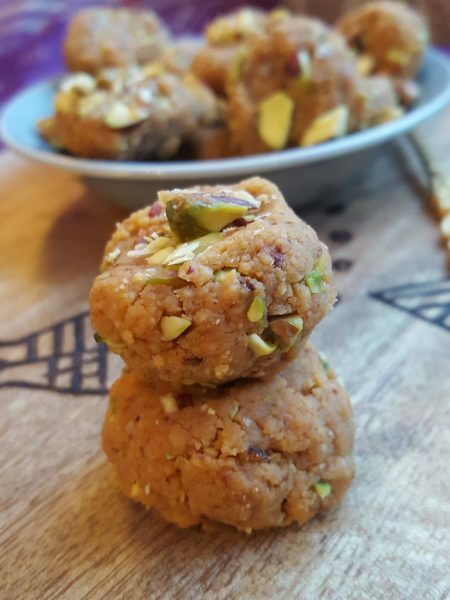 I have a soft spot for traditional mithai – the sweets and snacks that make an appearance around festival time. Over the years we have moved around a fair bit and I haven’t always found an Indian sweet house that I like. So a few years ago I took the leap, and made mithai from scratch. I started with this quick and easy Indian sweet that transforms ricotta into badaam burfi – a delicate cardamom scented almond fudge. So yummy that even your pickiest eater will try it….and love it. 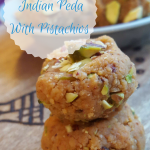 Once I was comfortable with homemade khoya (a building block for most Indian sweets) from scratch I continued to experiment with different Indian sweets. That’s how I ended up with these dollops of heaven. 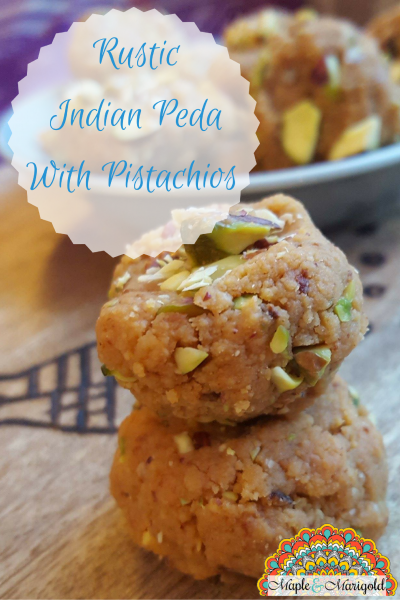 With their fudgy texture, peda is typically a North Indian sweet that is both decadent and easy to make. 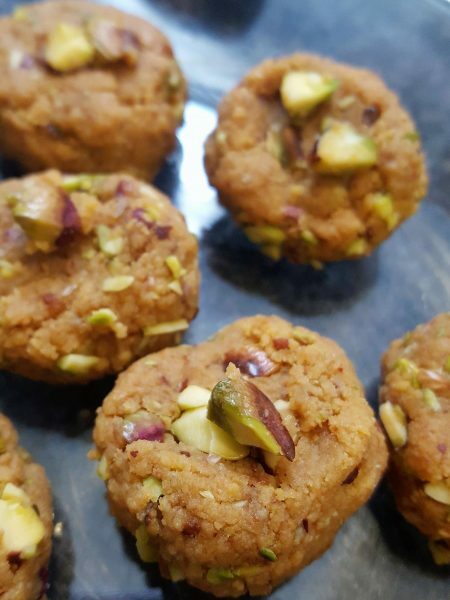 They are also easier for people who are just starting out to make Indian sweets at home. With almond burfi I had to watch the pan like a hawk to preserve the ivory colour of the cheese. 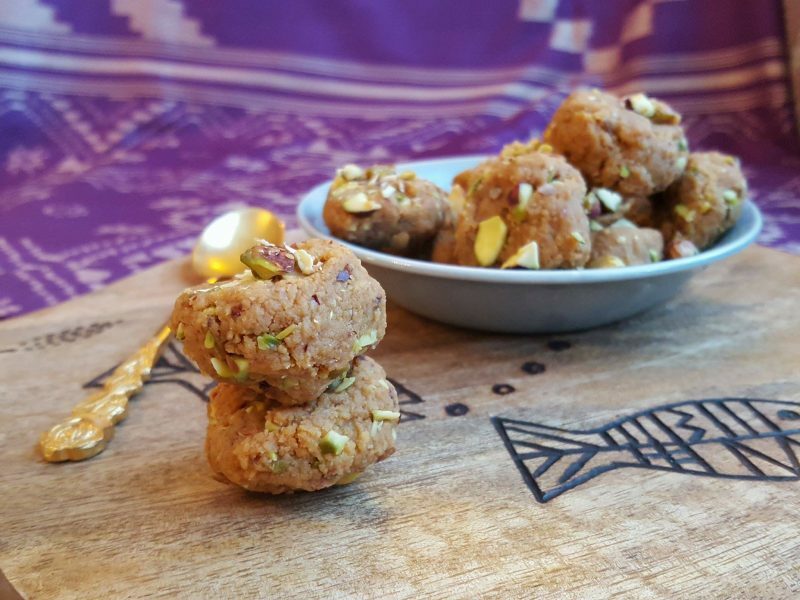 Pedas are more easy-going, imagine the country cousin to the more elegant almond burfi. They are rustic in colour and easy to shape, and with the addition of brown sugar any over-caramelization can be just folded in. 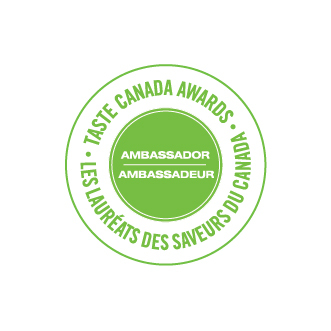 Delicious and oh so forgiving! 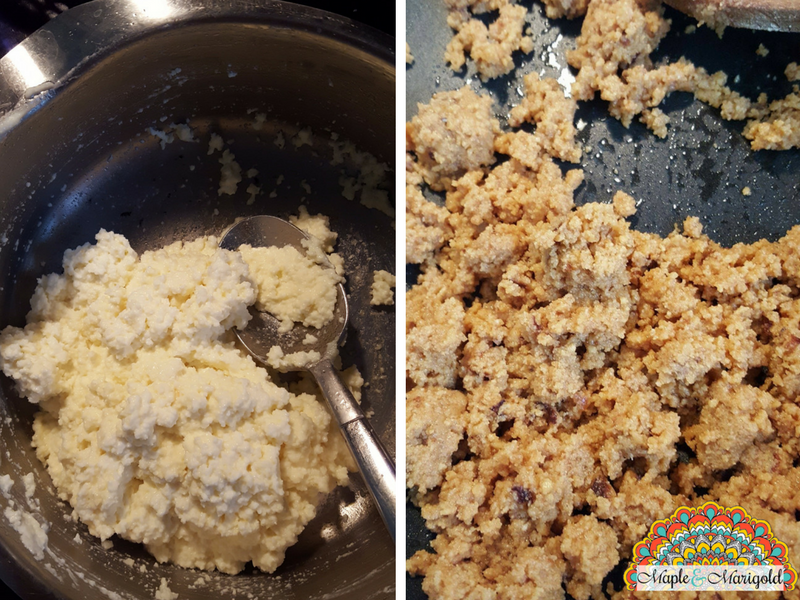 To start you can either make the khoya from scratch or buy it at your local Indian/ ethnic food store. Shape the mixture while it is still warm. 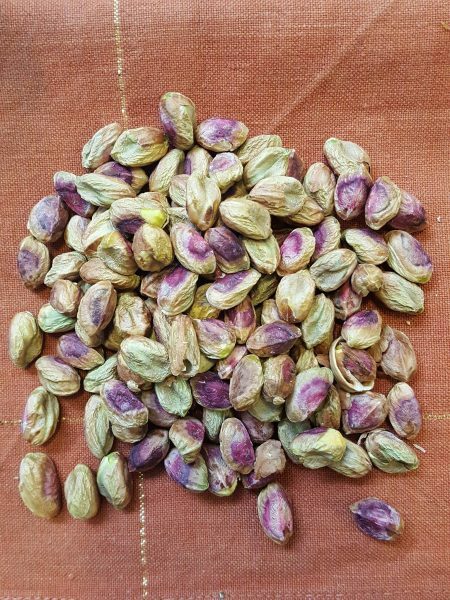 I love the flavour of pistachios and the colour and texture work here. Cashews would work as well. I find cardamom powder quite strong in flavour. A little goes a long way. Chop the pistachios on a piece of cloth so they don’t roll around and dodge the knife. You can skip a couple of steps and buy store-bought khoya and continue with the making of these pedas. Add the butter or ghee in a hot pan. Add in the khoya and turn the temperature down to medium. Stir the khoya and keep breaking it up and folding it to help evaporate any remaining liquid. Add in the cardamom powder. Fold in and mix well. Once the mixture has a grainy texture and all the sugar and blended in turn the heat off. Add in chopped pistachios and fold. Let the mixture stand for a few minutes. Now start shaping the pedas.The kids can help with this. We started off with round ladoo-like shapes and then moved on to rustic disc shape that looks like a peda. 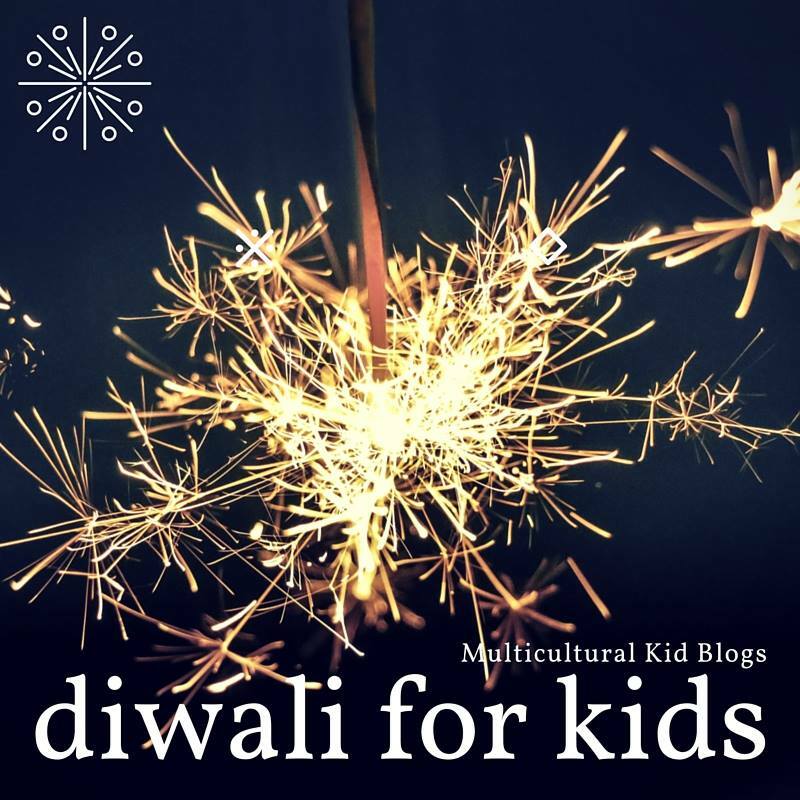 This post is part of the annual Diwali for Kids blog hop from Multicultural Kid Blogs! See the posts below on great ideas on celebrating Diwali with children. I absolutely love peda! I’ve never actually tried making them at home! will pin this recipe to try!